Hi my name is Jamie Dickerson. I’ve worked at Blue Boutique for the last six years. I started in the company as a counter girl working with jewelry and setting up piercings. Since then I took an interest in piercing and started apprenticing . I completed my apprenticeship about a year ago. 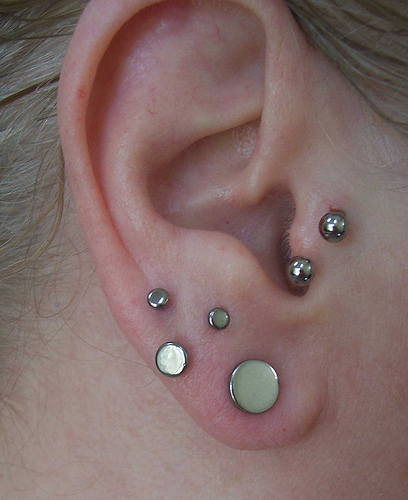 Today I’m going to be blogging about the basic earlobe piercing. The typical placement for an earlobe piercing is directly in the center of the lobe and can vary from one earring to multiple earrings. The jewelry for your piercing should be selected by you and your piercer. They may need to measure your ear because not everyone’s earlobes are the same. There is no standard length that fits everyone. I prefer to use titanium posts because titanium is a high grade metal with an allergy rate effecting less than 4% of the population. We will never know exactly when the first earlobe was pierced. We do know that the earlobe piercing predates some of the earliest known civilizations such as Sumeria, and Babylonia (Mesopotamia) from approximately 6000 years ago. People all over the world, even being isolated from each other, all felt the compulsion to pierce their earlobes, usually for aesthetic reasons, but occasionally as a way of displaying wealth, status, or rank, and sometimes as a part of religious practices. In Western cultures, British sailors made the earlobe piercing popular for males. Different myths tell of sailors piercing their ears when crossing the equator, if their ship sinks, or just for the look of it. Some stories tell that if a couple each wears one of a pair of earrings that they’ll never be separated. Today in western culture most people get their ears for aesthetic purposes but can also be done to mark special occasions such as rights of passage, birthdays, engagement, or marriage. There are no apparent health issues involved with standard ear piercings when done properly. However, a piercing gun is inappropriate for piercing of any kind. All medical professionals agree that piercing guns cannot be adequately sterilized because they cannot be sterilized in an autoclave. Wiping them down with an alcohol wipe is not sterilization; this means that they are capable of passing hepatitis and other diseases. The ear piercing studs are dull and tear through the body, causing unnecessary pain, healing duration, and other possible complications. Ear piercing studs are the wrong size and too short for most piercings making it harder for the piercing to heal. The earlobe is a relatively fast part of the body to heal, usually taking 6-10 weeks, with problems being very rare. This area heals well due to the amount of blood flow in the earlobes. There is no need to twist or touch your jewelry as this will only irritate your new piercing. To clean your piercing you can either use H2Ocean or a saline soak. With the H2ocean spray both sides two to three times a day. You can make the saline soak at home by using a non-iodized sea salt mixture: Dissolve 1/4 teaspoon of non-iodized (iodine-free) sea salt into one cup (8 oz.) of warm distilled or bottled water soak for five to ten minutes two to three times per day. Dry by gently patting with clean, disposable paper products. Cloth towels can harbor bacteria and snag on jewelry, causing injury. If you are interested in getting pierced and have any questions feel free to come in and talk with any of our piercers. We will be happy to help.